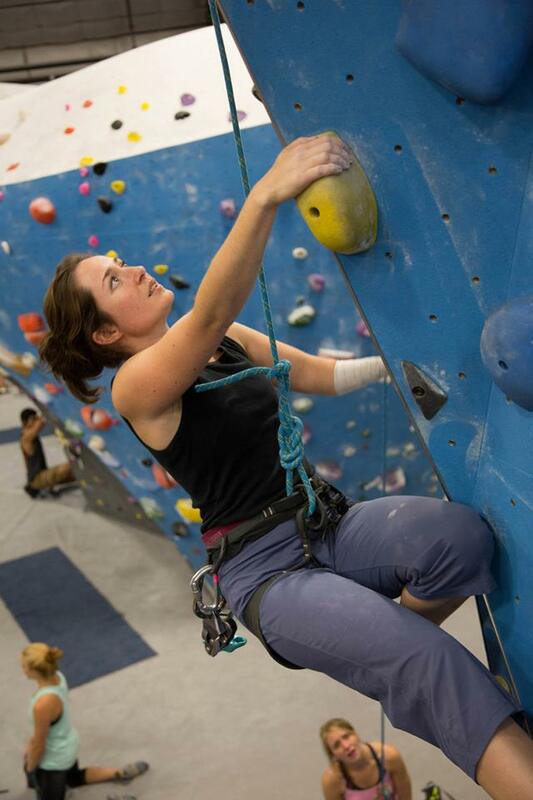 Born without her left hand, Paradox Sports Ambassador Maureen ‘Mo’ Beck is a force in the world of international paraclimbing. Later this month (Sept 14-18), she’ll be defending her 2014 world title at the IFSC Paraclimbing World Championships in Paris. We were lucky enough to pull her off the training wall for a quick chat about how she looks at competition climbing, and growing up different (and the same) as all the other kids. With a glint in her eyes, she is quick to say she doesn’t have a disability; she has a different ability…a diffability. Talking with her and watching her climb, it’s even quicker to see she is very right (pun maybe intended). Sam Sala: Super basics first. Where are you from and how long have you been climbing? 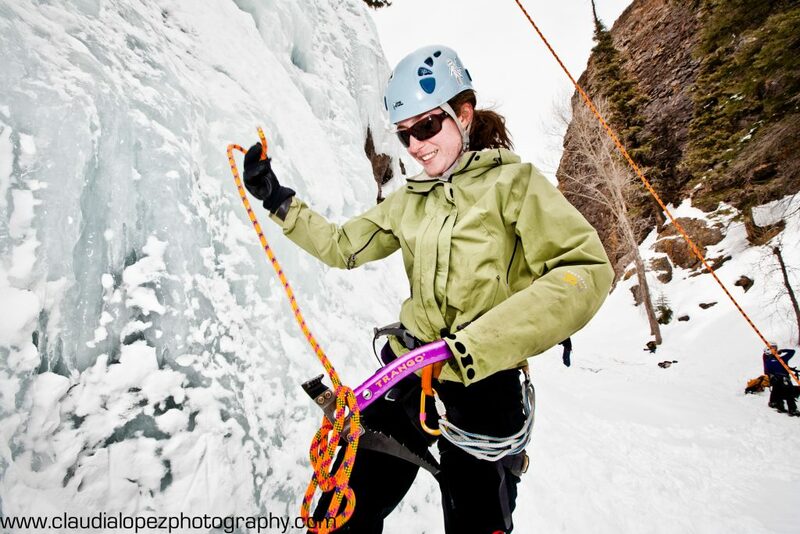 Maureen Beck: I’m from Maine and started climbing when I was about twelve years old. I grew up near the coast, so there was lots of rock to climb. I did a bunch of climbing in Acadia National Park. There was also a 4th class cliff behind a nearby jail, so some of my friends and I would go there and climb a ton. There was trash and broken glass and cigarette butts all over. It was a pretty classy place, haha! I got into ‘real’ climbing when I went to college in Vermont. We would spend a lot of time in the Adirondacks, North Conway, Rumney and other surrounding areas. SS: Unlike some of our other ambassadors who were injured or changed at some point in life, you were born without your left hand. I usually ask how someone adapted to their disability, but I think it’s fair to say you didn’t really do much ‘adapting’. How was growing up for you as a child? Did your family or other kids treat you differently? MB: I was never treated differently by anyone. 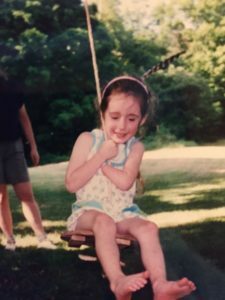 My family never used the terms ‘disabled’ or ‘handicapped’ because I wasn’t either of those. My parents would always encourage me to think up my own solutions for problems or obstacles, like figuring out how to cut my own steak. I’ve always known that everything I do will typically require a bit more thought, but for the most part, I just go about my business and it all works as well as it would for anyone else. I have always had a stubborn, rebellious side and doing something I was told I couldn’t do was the best possible act of rebellion there was. I played soccer which you would think was great because only the goalie needs to use their hands. Guess which position I played… I’d destroy my palm playing baseball bare-handed in P.E., especially if the teacher suggested I sit out. I embraced my difference and I think other kids saw that and respected it, so I never really got made fun of or picked on; except by my brothers, who would hide my prosthetic arm sometimes as a prank. But they also made some pretty awesome halloween costumes revolving around my stump, so it’s kind of a wash, I guess. SS: You played goalie in soccer and bare-handed baseballs. I guess it’s not a surprise that you’d be a climber too. Does the rebellious side of your nature drive you to climb things that people think you can’t? MB: Not that I’m out to spite anyone, but yes, I’d say it does a little bit. I love the inventive nature of climbing. Gym climbing on taped routes is one thing, but when you’re outdoors it’s just you and the wall. You get to make up whatever you feel like to keep moving higher I get to use my imagination a lot more than someone with two hands might, and come up with a lot of out-of-the-box solutions. That inventiveness has always played a big role in my life. 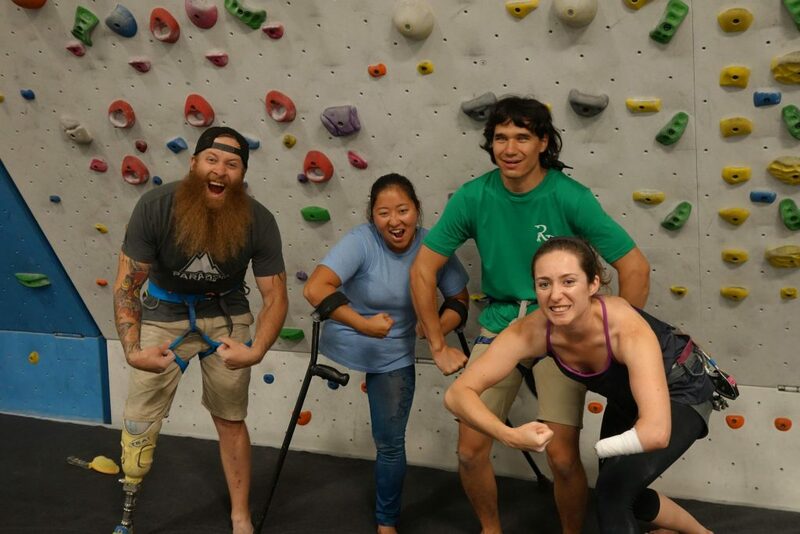 When I was younger, I used to think I was the only disabled climber in the world and that I would have to figure everything out for myself, forever, but now we have resources like Paradox Sports who are experts in the adaptive climbing world. SS: How did you find Paradox Sports, and what was your first impression? MB: Actually, Malcom Daly (co-founder of Paradox Sports) found me through the internet in 2009. My first impression was Paradox was a great group of like-minded folks. I had gone to some adaptive camps, but always thought they were lame. They always seemed to focus on the fact that the participants were disabled. Since I grew up never knowing anything else, I was always like, “Screw that, I’m not disabled! I just have one hand!”. Paradox [Sports] has always fit me perfectly, because they aren’t disabled either. They help you to not focus on what you can’t do, or even on having a disability, by constantly making you ask yourself what you can do with what you’ve got. SS: Has Paradox Sports affected your life outside of climbing? MB: For sure. Even before I was an Ambassador, Paradox had a big effect on my life. I would say it was through climbing and not really outside of climbing initially, but now I have some life-long friends with or without the climbing aspect. Paradox was a big part of why my husband and I moved out to Colorado, actually. We had a few options of places to move when we wanted to leave Vermont and I knew that I already had a great network of friends and people out here through Paradox events. I mean, my bachelorette party was even a Paradox climbing trip to Veadavoo! SS: How have you liked being an Ambassador for Paradox Sports? MB: It’s been awesome. 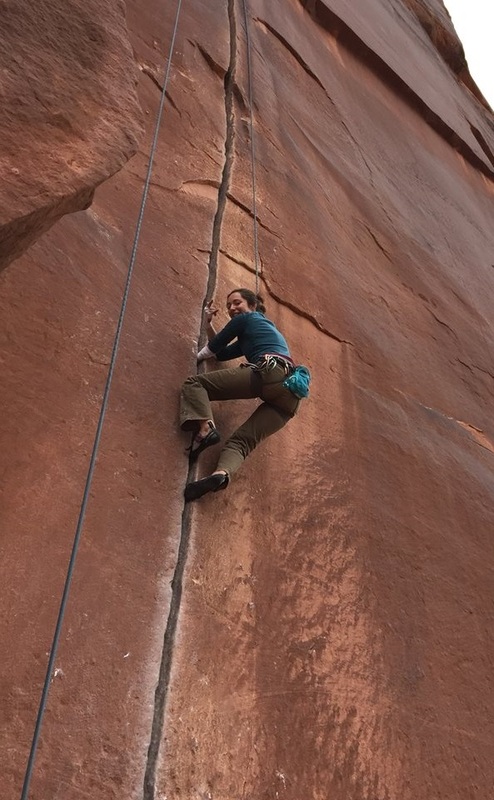 Since I’ve always climbed one-handed, I came in really experienced and in a sort of gifted position to teach and help people climbing with similar circumstances. Paradox has given me the opportunity to share that gift with a lot of folks. Like I said earlier, when I was younger I thought I was the only one in my boat, and I love being a resource for others who might have thought the same thing about their situation. I can help them adapt without them having to reinvent the wheel or do tons of their own research. SS: This September, you’re heading to Paris to compete, and defend your world title in the Paraclimbing World Championships. Congrats! When did you get into competition climbing? MB: I did a bit of competition climbing when I was in college, but it wasn’t ever motivating. There wasn’t an adaptive category and I knew that I’d always end up in last place so it never really got me revved up. But around 2012, I started doing adaptive climbing as it started getting more recognized as a legitimate sport. In 2013, the Vail Mountain Games had their first adaptive category. It was really fun. A lot of paraclimbers came to Colorado for it and we basically all ended up staying at the same place and really having a ton of fun hanging out. 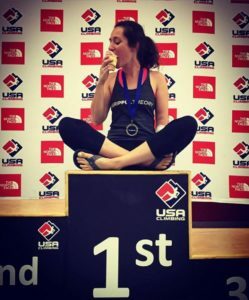 In 2014, and kind of on a whim, I entered the IFSC National Championship in Atlanta, and ended up winning in my category and earned a spot at the world championship in Spain. MB: Yeah, pretty much! The national competition was in Atlanta during the heat and mugginess of summer, so I wasn’t super motivated to go, but at the last minute figured ‘what the heck’ and booked a flight. When I won and found out I could go to Spain, it was a no-brainer. I think I ended up winning the world title mostly on luck though. I was just a little bit stronger than the other girls and obviously had more experience with climbing one-handed, so I made it a little further up the route than everyone in my category. I wouldn’t say it was a ‘world champion’ performance, but it got the ball rolling, and I’ve been training and climbing harder ever since. It’s almost like the past two years has just been a lead up for Paris 2016. SS: So aside from your attitude toward it, what’s changed in the world of paraclimbing, from Spain 2014 to Paris 2016? MB: Mostly, the competition. There are a lot more athletes, for one, and they have gotten a lot stronger recently. In past years, there wasn’t the participation at national events to fill out a team roster for worlds, so you’d get some folks who made the team by default and were really just going as a vacation and to have fun. You still have a lot of folks having a ton of fun, but I think that ‘vacation’ era is coming to an end. There are a ton of super strong climbers showing up this year and it’s gotten to the point where you really have to want it, and try hard, to get a spot on the national team. SS: It sounds like it’s pretty serious business now. How do you think it will affect ‘on a whim’ climbers going forward? MB: Well, given my history with ‘on a whim’, I hope it won’t intimidate people who consider themselves ‘regular folks’ out of entering competitions, but overall, I think it’s good for the progression of the sport. One of the things the adaptive competitions have that the regular comps don’t, is we all have this singular trait that bonds us, and we absolutely love hanging out with each other. The day after the national competition, we all got together for an adaptive climbing session and clinics. The paraclimbing community really is a tightly-woven one. I’m friends with almost all the girls I’ll be competing against this year, and even though I’m terrified of them, we still get stoked on what the others are climbing, and wish them luck on whatever projects they’re working on. SS: It sounds like the non-adaptive climbing community, at large, could learn a thing or two from the adaptive community. Is there any tension between the two groups at comps? MB: No, not at all. Actually this year, we’ll be fitted with the same outfits as the non-adaptive team. Like the Olympics and Paralympics, our events are separate, but unlike those, our events run alongside each other at the same time, so we’ll all be walking in as part of Team USA. We earned our spots on the national team, so why wouldn’t we wear the national team’s uniform, you know? There is a lot of pride in being part of a team like this, and the uniform is a symbol of the commitment and effort that was put in to get there. Treating everyone wearing it like world-class athletes will help some of the people, who might not see themselves in that light, realize they can be, or want to be at that level, and maybe help transform how they approach their climbing. SS: How is it showing up to a competition alongside the top-tier athletes that we all read so much about in magazines? Do you think paraclimbing athletes will get the same type of recognition some day? MB: It’s great, but can be a pretty surreal at times. In Spain, I was in the warm up area and was on the wall next to Adam Ondra. I hope one day paraclimbing will get to the level of having internationally recognized athletes. One thing that is tough to reconcile is that adaptive competitions are done on top rope, which I have mixed feelings about. On one hand, I totally understand that there are adaptive athletes who have spinal injuries or other conditions that don’t allow for any type of jarring falls. On the other hand, part of the draw of climbing is the spectacle of folks going big and not making it. The athleticism in paraclimbing is getting better though, which is a good start toward more spectator appeal. SS: What’s next for you after Paris? Will you be back in the gym and training for the next big comp? MB: Actually, Paris might be my last major competition. I want to get out climbing with friends and spend less time training in the gym. I’ve missed a few beautiful days climbing with friends this season because I was stuck in the gym, working on some specific piece of training. I’d like to get out on real rock a lot more after Paris. Every Fall, I spend a week with friends in Indian Creek, Utah, so I’m really looking forward to that when we get back from Europe! SS: Do you like crack climbs? Are you a fan of powerful movement or do you lean more toward techy stuff? What is your climbing style? MB: I love techy stuff, because I can’t fake my way through powerful climbs! Seriously though, I really do enjoy getting creative and working out my own sequence or combination of moves to get through a hard section. Since I’ve grown up climbing with one hand, I’ve always been creative and my footwork is good, which fits perfectly with techy routes. I also love crack climbing. If I can find a crack that fits my stump, it’s heaven. Like crack climbers love to say, it hurts so good! SS: There are a lot of climbers who put stock in what grade they can climb. 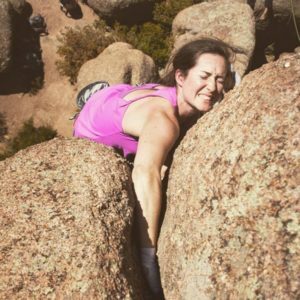 Do you trend toward wanting to do harder grades at the sacrifice of fun, or do you like going out and trying to have fun each time at the expense of not climbing super hard stuff? MB: I’d say a bit of both honestly, but I’m working hard to not focus too much on grades. Every climber wishes deep down that they could climb the really hard stuff, but the key is not letting grade numbers be the sole reason for tying in. The numbers shouldn’t mean so much to climbers, and they should mean even less to paraclimbers. I’ll lead a super tenuous, balancy, 5.11a, but then get totally shut down by the 5.9 next door because it has a juggy, overhung section that I can’t do with one hand. I used to get really frustrated with not making it through a climb that I thought was graded ‘easy’ knowing that I’d climbed harder stuff, but I’ve gotten much better about letting the numbers go and realizing that I can’t climb everything, and that I need to be happy with having fun with climbing what I can; with showing up, trying hard and having fun. Regardless of the grade, if you try hard and have fun, you’ll grow as a climber a little bit each time you go out. I’m hoping to climb my first 5.12 this year in Indian Creek, but practicing for that isn’t going to stop me from having a blast climbing easier stuff with friends! SS: Do you have any advice for anyone who is looking to start adaptive climbing? MB: Don’t be shy! Go out and find resources like Paradox Sports. Call them. Ask them questions. You don’t have to reinvent the wheel. Chances are, they’ve dealt with a similar situation before and will know how to make it work. You just have to make the decision to get out and try. One more thing I’d say is embrace the struggle and realize you’re not gonna be great the first time you try anything. So many people these days want to be instant experts, or just don’t want to be the new person. We all started somewhere. We were all the new guy at one point, and that is as much a part of the journey as any other piece. Have patience and keep at it, and you’ll get better. Then one day, someone newer than you will ask a question and you can pass along some of what you’ve learned. That’s what it’s all about. Check out Mo’s highly entertaining blog www.MoInMountains.com to follow her adventures to Worlds and beyond!